Robert-Goldwater-Library: Brit post-mortem: "catastrophe sunk in a swamp of hubris..."
Brit post-mortem: "catastrophe sunk in a swamp of hubris..."
You may remember the Millennium Dome - big grey tent in Greenwich - cost a billion or so, give or take a couple of hundred mill. Now a useful navigational aid for lost pigeons and bleary-eyed travellers flying over the East End. You may remember too, the soul-searching it provoked about why the British are incapable of doing anything decent on a grand scale. The French, we consoled ourselves, would never have conceived such a disaster. Well now they have. It's called the Musée du Quai Branly, the grandest museum built in Paris since the Centre Pompidou 30 years ago, and arguably the most important new one in Europe in a generation. And it is, if you will forgive a little flourish of Gallic overstatement, a catastrophe sunk in a swamp of hubris, though there is a lovely caff and ace office block in the not quite finished garden. At least with the dome we could all laugh at the idea of Peter Mandelson being in charge of something called the mind zone. Quai Branly makes you want to cry. Nor did the dome try to kill you (mind those badly finished stairs), or make you feel sick (the jungly lighting is giving visitors headaches) or manage to diss half the cultures of the world. Like many messes, it began with the noblest of intentions. 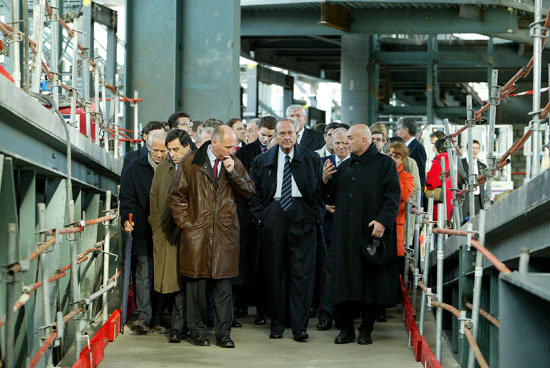 Long the pet project of Jacques Chirac, it was supposed, in the president's own words, to "put an end to the disregard of civilisations too long ignored or misunderstood ... to look upon the Other with greater knowledge, respect and openness of mind". So how then have these artefacts from civilisations continents and millennia apart bought, stolen or borrowed through 400 years of French colonial adventuring come to be displayed with minimal explanation in a dark, confused jungle echoing with the sound of distant tribal drums like the worst malarial European nightmare of the dark continent? Museums are meant to tell stories, and never have more long-abused objects needed theirs told so badly. Instead they are displayed, mostly unlabelled, in one dark vitrine after the next: mute, menacing and inscrutable, all the cliches we should be running headlong from. As with the dome, it would be wrong to blame the architect entirely. The clearly brilliant Jean Nouvel had the balls to admit, as panicked workmen bodged jobs all round him and the museum received its first visitors, that he needed more time. He insists he never intended the main building, a "crawling, lizard beast" on stilts, to hold the thousand vitrines that now fill it. But Quai Branly's big problem is whether it should exist at all. Why, as has happened before, should space not be made among the Greco-Roman rubble of the Louvre for the best of this African, Asian and American art? Its name alone - taken from the traffic choked artery on which it sits - is proof of how little its contents have in common, other than that they once may have shared space in the curiosity cabinets of the four former Paris collections it unites, one of which boasted five live crocodiles in a pit in the basement. The double tragedy is that the museum was also seen as a gesture to France's disregarded and discriminated against immigrants, particularly its African populations who are at the burning edge of anger in the poor suburbs. But all is not lost. If Chirac is sincere in his passion to champion a desperately needed counter narrative to the triumphalism of western art, he will take the humiliation of closing the building - as happened with Daniel Libeskind's Jewish Museum in Berlin - until the curators sort their mess out. If not, the unhappy spirits locked in the bowels of Nouvel's beast, like the restive kids in the banlieues, may have their own say.